Caretaker manager John Carver has urged Newcastle United to act quickly to appoint a successor to Alan Pardew. The Magpies have failed to win any of their four matches since Pardew, who left for Crystal Palace, was last in charge of the team. Carver, 50, has said he would like the job permanently but said there had been no talks over his future at the club. "The crowd are on the edge of their seats, waiting on a decision and the club have to make that soon," he said. Newcastle managing director Lee Charnley and chief scout Graham Carr have been handed the task of identifying Pardew's successor and have already spoken to a series of candidates. French managers Remi Garde and Christophe Galtier, German Thomas Tuchel and Derby County's former England manager Steve McClaren have been linked with the post. 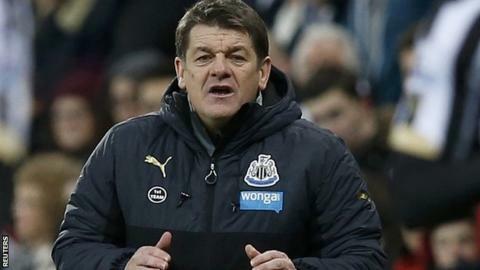 Saturday's 2-1 defeat by Southampton left Newcastle 11th in the Premier League and Carver, who worked as Pardew's assistant from 2011, said their season was in danger of petering out if a new manager was not named quickly. "They have to do something. We don't deserve to drift away," he said. "The fans won't put up with that and something has to be done."